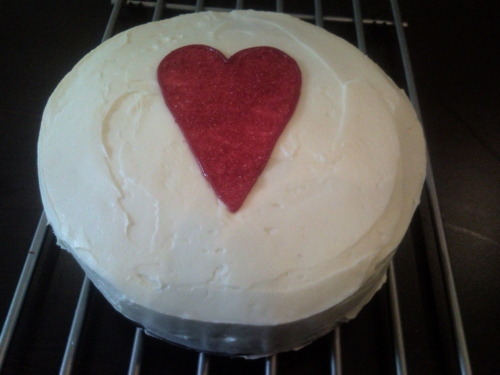 I was very proud of of the finished cake, although the perfectionist in me was a bit disappointed in the slight non-uniformity of the heart and…I was told by a guest that I wouldn’t cut it as a plasterer! the cheek! But it’s the thought that counts right? and whether it actually tastes any good (which it did!). 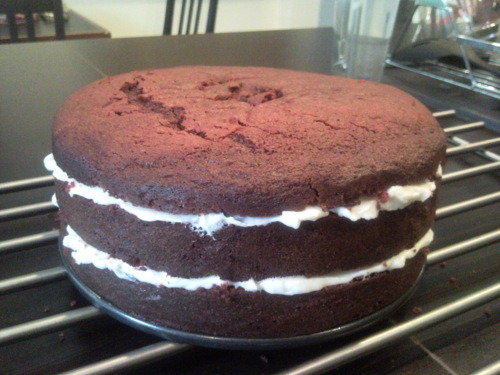 What you can’t see from the photo above is that beneath the layer of gorgeous cream cheese frosting is a triple layer red velvet cake…. I followed the Hummingbird Bakery recipe, which I’ve used previously to make these cupcakes. Preheat the oven to 170 degrees and line an 8 inch cake tin. I made do with 1 tin and sliced my cake into 3 but if you’re lucky enough to have 2 or 3 tins you can make the layers separately. Put the butter and the sugar in a freestanding electric mixer or use a handheld version to beat them until light and fluffy. Add the eggs and mix on a lower speed until they are well incorporated. In a separate bowl mix the cocoa powder, red food colouring and vanilla extract together to make a thick, gloopy, dark red paste. If you’re using the concentrated gel food colouring you only need about 1tsp but you may need to add a splash of water to make it into a paste. Add your red gloop to the butter mixture and blitz it up until evenly coloured. Pour in half of the buttermilk and mix at a slow speed, add half the flour and mix, then add the rest of the buttermilk and finally the remaining flour. Then give it one last mix just to make sure. Finally, add the salt, bicarbonate of soda and vinegar (which creates an enjoyable fizz!) and mix it slowly into the cake batter for a couple of minutes. Pour the finished mixture into your prepared tin(s) and put in the oven. If you’re using 3 tins, bake for about 25 mins. If you’re using 2 tins, pour a third of the mixture in one (this will need to cook for 25 mins) and two thirds of the mixture in the other (this will probably need a few minutes more approx 30/35). If, like me, you’re lacking in the the tin department and are just using the one, you’ll need to cook it for about 50 minutes. I checked mine after 45 minutes but it was still very runny in the middle. 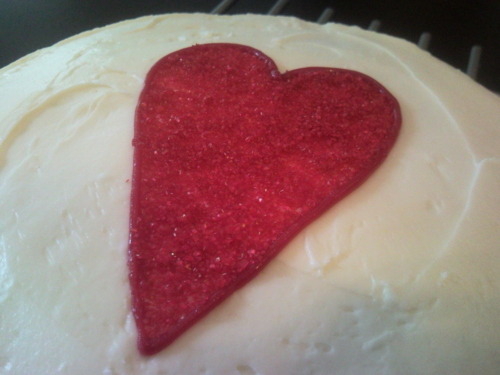 You’ll know it’s ready when a knife or skewer inserted into the middle of the cake comes out clean. 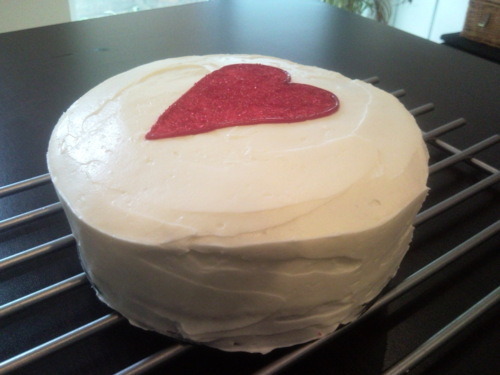 Beat the icing sugar and butter together (this gets a tad messy) using either a freestanding or handheld electric mixer. The recipe says to beat it until the mixture comes together but I always lose patience and in an attempt to limit the amount of icing sugar wafting around my kitchen, I add the cream cheese pretty much straight away. I usually zap the butter in the microwave for 30 seconds first aswell, to make sure that it blends in well and that there aren’t any little lumps of butter left in the icing. Once all of your icing ingredients are incorporated, turn up the speed and beat well for about 5 minutes until smooth and creamy. Be careful not to overbeat it or it’ll become runny. 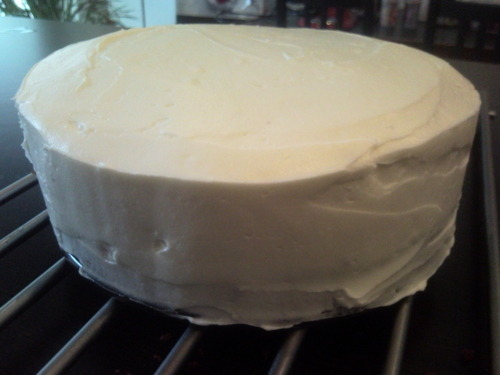 Use the icing to sandwich each of the 3 layers and to coat the top and sides of the cake. 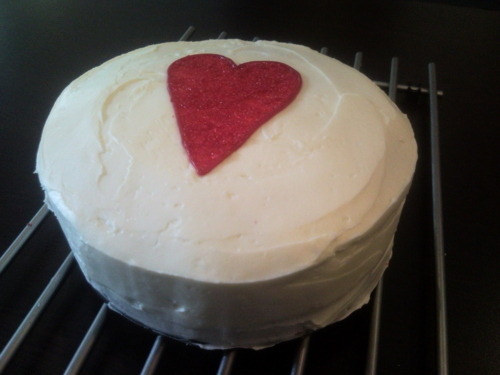 I use a metal spatula, which I dip in boiling water regularly…it makes smoothing the icing out a lot easier. Who would’ve thought that a cake containing buttermilk and vinegar would work…but it does! and produces a gorgeously moist cake everytime!